Hi, I am interested in your 2002 Chevrolet Corvette (stock #5081-CHA) listed on Autotrader for $25,995. I'd like to get more information about this vehicle and confirm its availability. We could call this car a sleeper, but quite frankly, everyone already knows not to mess with a 2002 Chevrolet Corvette Z06. But when it has been upgraded with a supercharger to create a 700+ hp beast, this speedy Vetter enters supercar territory. We all know the legend of the Z06 by now. Chevy started with their lightest and strongest Corvette configuration, the FRC (Fixed Roof Coupe). Then they shed weight wherever they could, even including utilizing a thinner windshield. 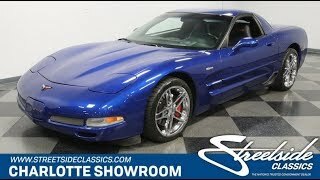 The result was the leanest and meanest Corvette to hit the streets. But that might not even be your first impression of this one. Thats because the Electron Blue still has a deep luster that gives it an electric personality. All the details are right, too, with the correct Z06 badging and cooling duct under each door. While the Corvettes body has graduated into a modern age, Americas sports car still has room for chrome on the mirror-like special Z06 double-five spoke alloy wheels. So its a great-looking car youll love to show off, even before you mention the monster under the hood. Inside is exactly what you expect from a special Corvette a loaded interior thats comfortable for two. The black leather buckets match the dark interior, and the special red Z06 stitching reminds you this coupe is out for blood. This car offers plenty of luxuries, such as dual zone climate control, power steering, power windows, power locks, keyless entry, power mirrors, power seats, cruise control, and a Bose AM/FM/CD stereo system. Because this is a modern classic, it also means modern safety features such as dual airbags and anti-lock brakes. Plus, the FRC style body has a trunk that can truly carry a weekends worth of luggage (including your racing suit and helmet.) Youll never get tired of watching the gauges do their dance every time you start the engine, but the head-up display means you never have to take your eyes off the road during performance driving. You might have also picked up on some very handy upgrades, like the B&M Ripper shifter as well as the boost gauge and digital tach mounted on the A-pillar. Tilt the hood forward and see the original numbers-matching V8 proudly sitting in the engine bay. But you also instantly recognize Procharger P1SC package. More than just the supercharger, this motor was built by Heintz Racing to with all the right supporting components, including CNC stage 3 ported heads, ARP bolts, LSX Fast intake, 90MM throttle body, and a custom Comp Cams performance camshaft. Plus, this one knows how to announce its power with headers that feed a Random Technologies super high flow cats on their way to Corsa touring-style turbo mufflers. Its a total package build thats rated at 703 hp, and delivering 573 hp to the rear wheels. So yes, this one delivers over 40% more power to the pavement than the stock Z06 made from the crank and we have the dyno sheet to prove it! You have complete control over all the sound and fury the V8 brings thanks to the six-speed manual transmission. As a true competition machine, this also received its own suspension upgrade package to make the fully independent suspension perform at its best during high speeds. And keeping everything in control is also the large four-wheel disc brake package and Michelin Pilot Sport rubber. Complete with build receipts and maintenance records, its amazing you can get such a slick and powerful street machine for such an obtainable price. So you know you need to act quickly if you want to take this supercharged Vette home. Call now!